IdeaPaint is a marvelous paint that transforms nearly any surface into a dry erase whiteboard. But the IdeaPaint team sees their product as more than just a material. They consider it a creative catalyst. To celebrate their role in the creative process, they started the Studio Session series. Every other month, the company invites a local artist or creative agency to reimagine their Boston headquarters as an art space. With their product on every wall, the entire office is a blank canvas. In my December 2014 installation titled “Winter Wonder,” I explored our relationship with winter weather. The mural depicts a familiar scene of wind and snow whipping about a row of Boston brownstones. The adults bundle up and look down. However, as they begin to glance up from their gloom, they begin to see the world through youthful eyes. As the viewer walks deeper into the installation, they’re welcomed into an imaginative, cartoon world, inspired by the snow that has enveloped and transformed their once staid surroundings. Far too often, cold weather is seen as an obstacle. Icy roads, traffic, shoveling. Children don’t see it that way. While we grumble and groan, they celebrate. Snow blankets familiar landscapes until they’re wholly unrecognizable. It presents an irresistible opportunity for play. Children build snowmen, throw snowballs, catch flakes on their tongues, and dive into drifts with wild abandon. Once we’re responsible for a car to drive or sidewalk to clear, we forget the magic of it all. It’s clay, dropped from the sky, ready for us to create and escape. Like snow, IdeaPaint inspires creativity once thought lost to youth. It breaks down traditional barriers and invites everyone to contribute, not just the “creative types.” The company’s mission is to “fundamentally improve the way people work.” With this installation, I sought a similarly fundamental transformation: for the viewer to see New England winter for its true wonder, finding not burden, but opportunity. There is joy and imagination to be discovered in our coldest, darkest moments, even if only for a moment. 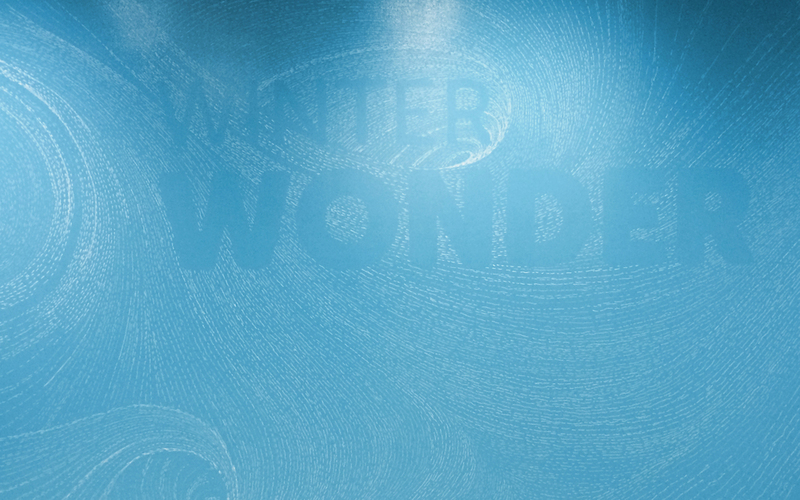 IdeaPaint invited the public to the opening of Winter Wonder on December 10. After weeks of labor, filling hundreds of square feet with markers alone, it was a joy to share my work with the community. The evening was wonderful, as dozens gathered together together to enjoy art, comfort food, and the warmth of good company.